Slushy Maker: Create your own slushy in less than a minute. 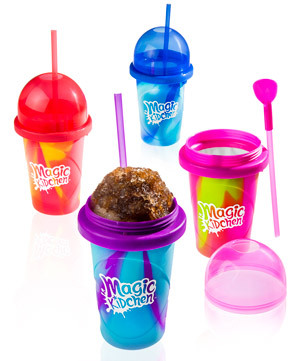 The Slushy Maker quickly turns your favorite drink into a frozen treat! The Slushy Maker is easy enough to be used by almost any member of your family. Chill the Slushy Maker in the freezer for 4-6 hours, remove, pour in your refreshment of choice, and squeeze the silicone cup. A one-minute massage is all that’s needed to slush-ify your drink to perfection. The reusable cup has a removable dome lid and handy, reusable spoon-straw to help you slurp down the slush. Please note that the colors and design of the Slushy Maker have changed slightly since this video was made. The product still operates (makes delicious slushies in 60 seconds) in the same way. 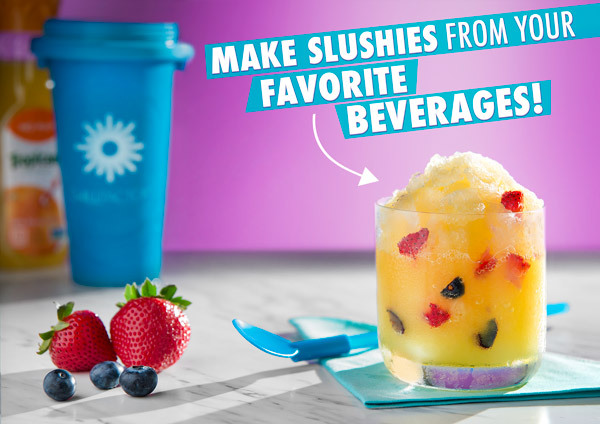 The Slushy Maker’s rapid freeze technology makes it easy to create your own slushy right in your kitchen. 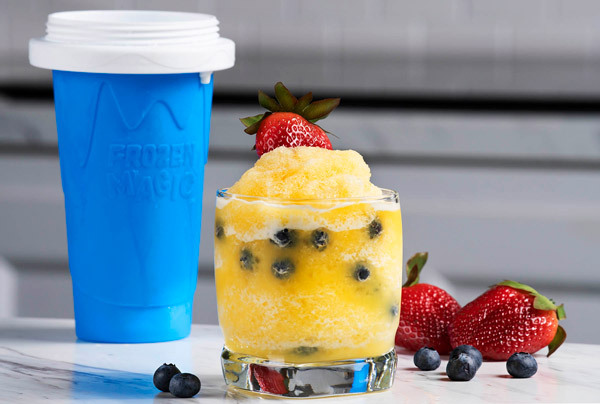 Simply store your Slushy Maker in the freezer prior to use (to bring the cup’s insert to the right temperature), add a chilled beverage of your choice, and then start squeezing. 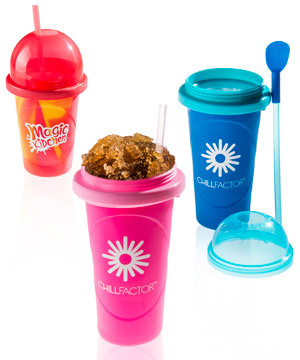 The pliable silicone cup allows you to transfer the chill of the Slushy Maker directly into your beverage. 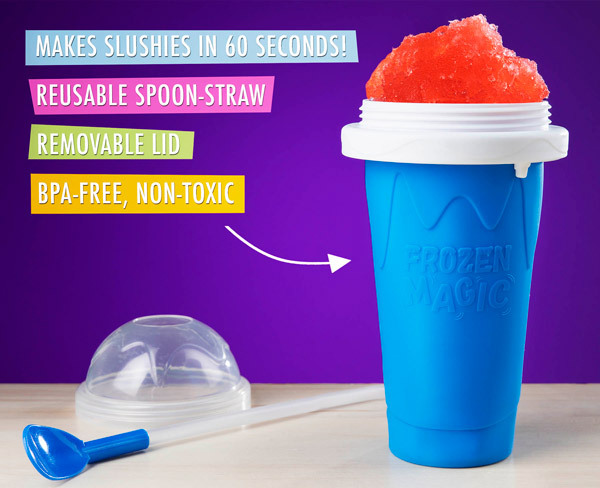 In 60 seconds or less, your drink will become a deliciously refreshing slushy! 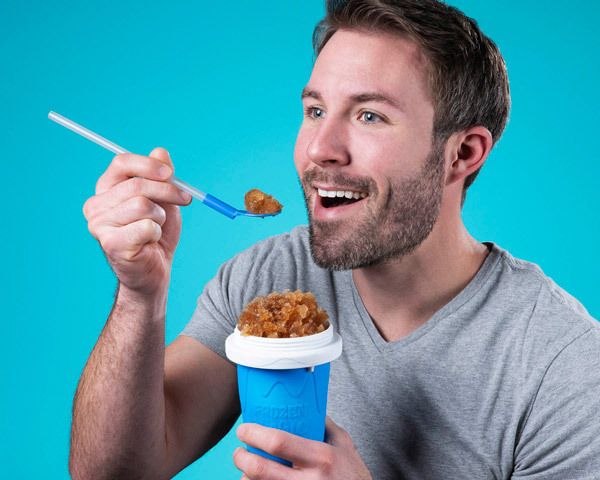 The Slushy Maker is designed to make it easy to enjoy a satisfying slushy. The removable dome lid helps prevent spills, and the reusable spoon-straw lets you choose whether to slurp or shovel your refreshing treat. All parts of the Slushy Maker are non-toxic and BPA-free, so the only thing you'll have to worry about is the dreaded brain freeze. Most homemade slushies use a mixture of ice and juice to attain semi-frozen consistency, which can lead to a watered-down version of the original flavor. The Slushy Maker requires no ice, instead using a freezer lining as its cold source. The result is a pure, slushified version of your favorite beverage that tastes exactly like the original. Tastes like your favorite beverage, because it is. Don’t be boxed in by the limited slushy flavors available at the ice cream shop; use the Slushy Maker to customize your own cold concoction. You can slush a soda, have a frozen frappuccino, or brew an icy iced tea. Add nearly any chilled beverage to the Slushy Maker, give it a quick massage, and enjoy a new version of your favorite drink. Or try something you’ve never seen before, like a chocolate milk slushy! The reusable Slushy Maker lets you experiment with a new flavor every day. Simply wash and refreeze the cup to begin your next frozen adventure. Two members of the Vat19 video team put the Slushy Maker through its paces in this episode of Peep This. Please note: the colors and logo on the front of the Slushy Maker have changed slightly since this video was made. 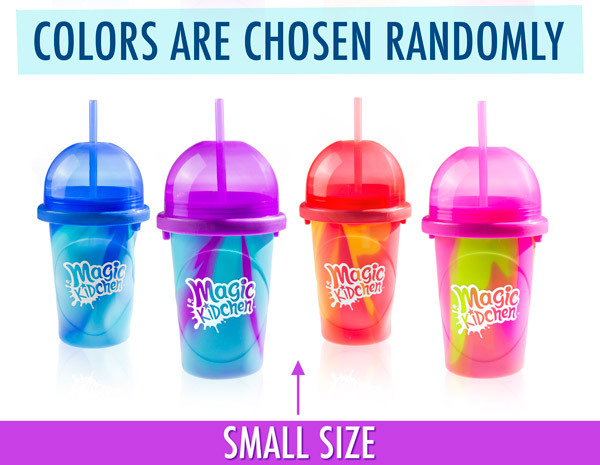 The small Slushy Maker is available in an array of bright colors. Due to the way in which we receive the small size, we’re not able to offer color choices. However, no matter what you receive, the color will be as fun as the Slushy Maker itself. Please note that the large Slushy Maker is only available in blue. If you purchase the small Slush Maker, you will randomly receive one of these attractive colors. Question: How will I know when the Slushy Maker is ready to be removed from the freezer? Answer: If the Slushy Maker crunches when you squeeze it, then it’s ready. This generally takes 4-6 hours, which is why we recommend storing your Slushy Maker in the freezer so you’re always ready to slush! Question: Can I slush salsa in my Slushy Maker? Answer: We're so glad you ask! It makes having made this video so less awkward. 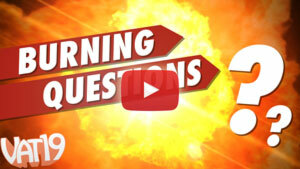 Jon and Joey answer your "Burning Questions" about the Slushy Maker. Question: Can I slush a hot drink? Answer: The Slushy Maker works best when the drink has been pre-chilled. Liquids that are hot or at room temperature may be difficult to slush. Question: Can I use diet soda in my Slushy Maker? Question: Can I use dairy products in my Slushy Maker? Answer: Yes, but dairy products typically take a little longer to slush. The best practice with dairy products is to pour the liquid into your Slushy Maker and put the cup back into the freezer for 3-4 minutes before squeezing. Question: Can I use alcohol in my Slushy Maker? Answer: Yes. However, alcohol has a lower freezing point than water, so it may not slush well on its own. You can add an alcoholic drink to your already-made slushy, but you might want to do it at the end, as it can cause your slushy to melt. Question: What's the difference between the two sizes? Answer: Both the large and small sizes of the Slushy Maker work the same and produce identically delicious slushies. 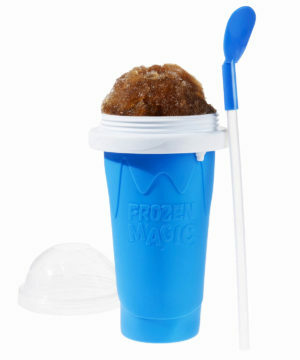 The large size has a slightly taller cup (although a slightly smaller dome) and holds about an extra two ounces of slush. Question: Could I use the Slushy Maker to create 44 gallons of slushy? Answer: You could, but we think we found a faster way if you want to make an absurd amount of slushy all at one time.